Gear Review: Pathfinder solar-powered navigational watch. 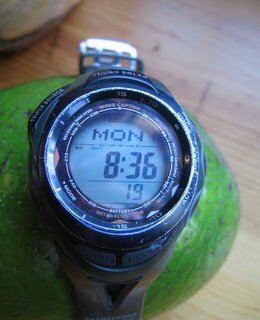 I have been wearing the same Casio Solar Atomic Pathfinder #Paw1200 Watch for almost 3 years now. That’s 2 more years than any other navigational watch has lasted me. The greatest thing about it, is it never needs batteries–it’s solar powered. On most navigational watches the batteries need to be changed every year; this one just keeps running. The specs say it can go 6 months without seeing the sun and still run. It’s nice to be able to use the compass feature and not worry about running the battery down. The altimeter is the most accurate I have ever used. It’s called atomic because it sets the time using some big clock in the sky or something… totally unnecessary. Setting the compass declination is different than for most navigational watches. I use it without setting the declination; it’s close enough. It has a ton of features. I use the alarm, compass, altimeter, stop watch, time, date, and once in awhile the thermometer. There are a lot of different Pathfinder watches. Mine might be a little too features rich. The important features, to me, to look for are: Solar powered with an altimeter and compass. Cons: A little more complicated than other watches… comes with a 150 page manual. I would like it better if you could just set the declination like other navigational watches. Has too many features. Suunto: quit being waterproof after one year. High Gear: quit working after one year, replaced batteries still didn’t work. Previous Previous post: Camp towel versus ShamWow! Next Next post: Melting snow as your water source.